There is also a 3210 XT. It looks like the 320 XT but it is blue. Or at least that is how I remember it. Once I get to the box in which it is stored, I will take a photo. Yes that is the one. I think on the back of the computer itself it says 3210 XT which I guess differentiates it because of the blue color. That makes nine now. I have release dates for Robert's six plus the Travel, but not the apparently rarer 309XT or 325XL. The 325XL sounds like 1996/97 from JBs website. Is there any more information on the 309XT? as to me operating the Elite Private Line..
PS - A certain jcd_2008 (37) from France bought both a 309XT and a 325XL (10 Euros) on Ebay in October, so maybe not so rare? I know only 6: 301XL, 320XT, 416XL, 430XT, 532XL, 540XT. Which am i missing? in my auction database, I also have 310 XL and 425 XL but these are old auctions and could be mistakes from me. 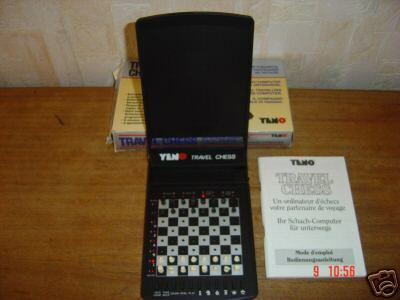 Yeno chess computers are very rare in Germany. Nothing on Wiki about Yeno at all! But I see that Nick has seven of them !! Mmm will have to get one of these Yenos. You guys are a great source of Yeno information. Timeline updated. Should be able to put up the Sale & Swap 2009 webpage in next two or three days. Discounts for regular posters on this Message Board ! And with the GBP worth practically nothing you will be almost stealing them. 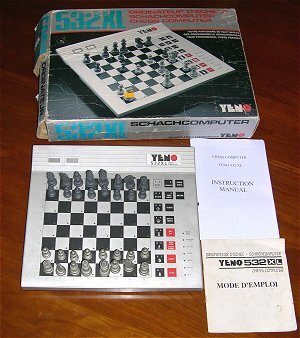 Yeno was specialised in low cost poor software game. The 301XL was the first of the list. 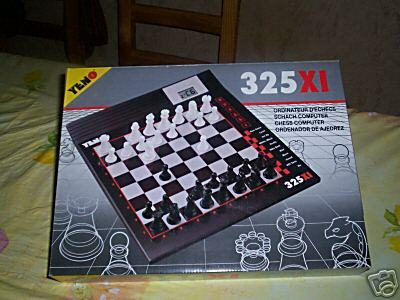 However they also had one low cost good software game: the 532 XL with a variant of the MM-II software. But they did not have a good success with it. 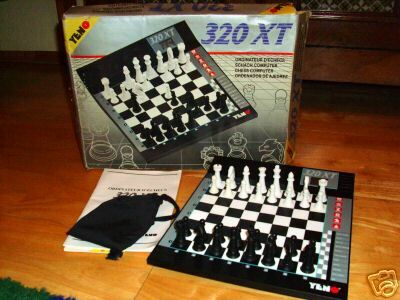 Note that the 532 XL has your pieces. Tom your Yeno may be past it's best, like one or two of us here , but the chess pieces are a nice change from the usual bland designs. For the condidtion of the Yeno computer I'm fully to be blamed. First, I had it displayed on a cupboard for a long time, and when it looked somewhat dirty after that maltreatment, I cleaned it with some rather abrasive detergent. 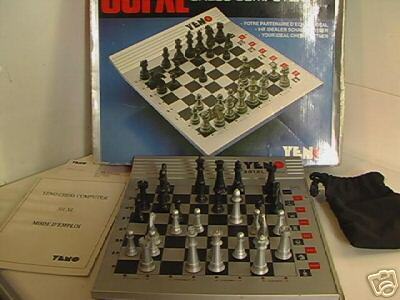 But as you can see, the chessmen still look alright and their similarity to yours is striking. I agree I have never seen the like of them before. 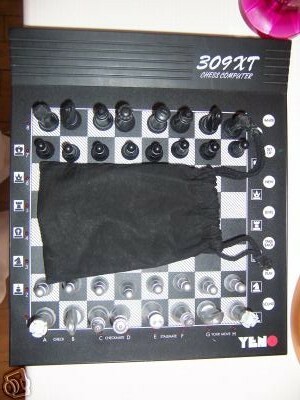 By the way, as I was reminded of the existence of the Yeno301XL, I made a new picture and added some more information about it on my site. And I played a few more games, which convinced me that this computer may not be a titan, but cannot be ranked amongst the very weak. Out of four games, it beat Fritz-one-ply twice and one game was drawn. It lost only one game (because it had too little insight into endgames). And I found that the information which I read on the Internet that this Yeno has no opening library, is not entirely correct. The computer has an opening library, but probably no greater than a few dozen moves. Hey that's too near the truth Bryan. 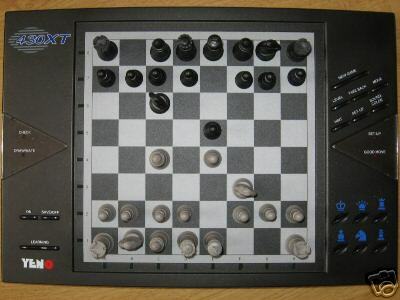 If a chess computer arrives during the summer I tend to play just a couple of games to make sure everything is Ok and put it in a heap. The heap grows and stray piece sets, adaptors and bits 'appear' around the place. In winter I try to make sense of chaos. These chess pieces probably came with a job lot from a old chap in Abingdon. There was an Atlanta, Diamond II, Mega IV, Voice Sensory and something called a Go 1680L. 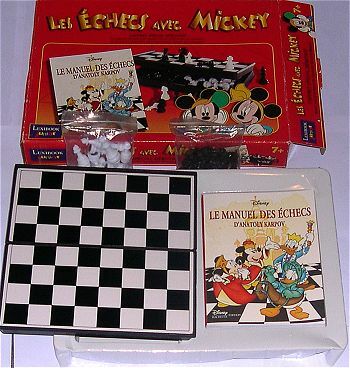 All the chess pieces were mixed up in a box. I thought the pieces might be from the Go, but it turned out No. Now are there any suitable places for Oldies with failing memory chips in Cheshire Bryan? Maybe it's time to start looking at those old people homes around your area now that your memory's starting to fade ha ha. Many thanks Tom. Mystery solved ! 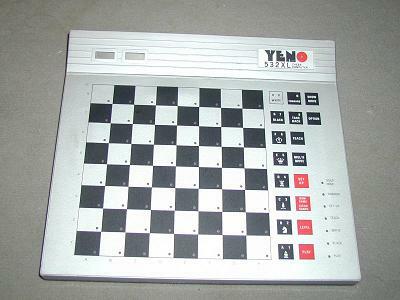 Though I have never had a Yeno 301XL. I wonder where they came from? 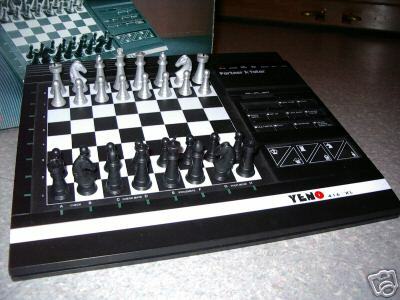 maybe from another Yeno chess computer? Sorting through the collection today I came across a set of mystery chess pieces. 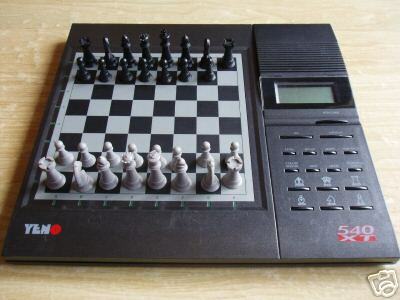 I have no idea which chess computer they belong to, if any. They are plastic with a rubbery feel with magnets in the base. Can anybody identify them please? 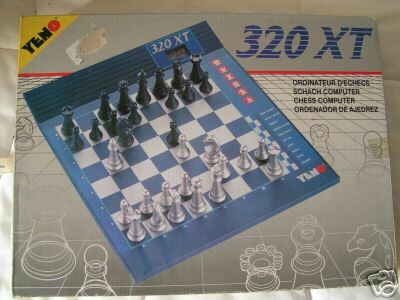 they look like the chessmen for the Yeno 301XL. I bought my computer in Paris a long time ago, wich is clearly visible. It doesn't exactly look like new . I hope yours looks better.